The Arsenal baselayer long sleeve t-shirt is to wear under your new home shirt or training tops. As Arsenal gear up for some serious training for their games, they do so in comfort with their bodywear long sleeve t-shirt. 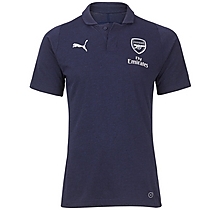 Whether you are training for your own up coming games or want to wear this under your Arsenal home jersey, you will love the comfort. The red Arsenal bodywear long sleeve t-shirt is super light and has the distinctive Puma logo and Arsenal crest on opposite sides of the shirt.